The Lady T-Birds have had a rough start to the first part of the season. During the second half of the game, junior Bailey DeClue shoots a three point shot against Cunningham in the first round of the 54 Classic. The girls lost 54-20. The T-Birds have won one game and that came with a win against the Stafford Trojans 51-19. 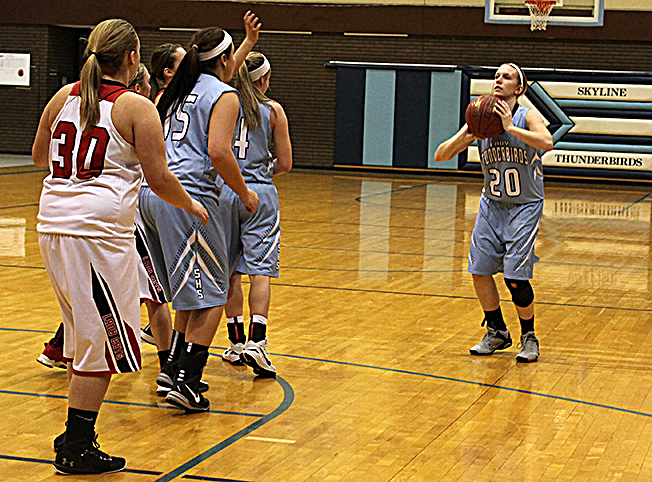 Three of their losses came to the hands of teams that were ranked in the Top 10 in Class 1A-Division II. Cunningham was ranked first, Attica was ranked third and Bucklin was ranked seventh. “It hasn’t gone that well in our favor, but with a little more practice and patience I think we will turn it around and get more wins when the second part of the season comes around, ” sophomore Madalyn Owens said. Skyline lost four seniors from last year’s group. They have no seniors playing, six juniors, five sophomores and four freshmen. Most of the girls went from playing JV to going right into varsity. “Varsity is more of a fast paced tempo game and usually play against teams that have players with more experience than we do,” Owens said. On Tuesday the T-Birds took on the number one seeded team in the 54 Classic tournament, the Cunningham Wildcats. The girls stayed in the game and were only down by 11 at the end of the first half. The second half turned into a blowout, with the Wildcats taking full control of the game. The T-Birds were held without a single point in the entire third quarter. The fourth quarter was with a running clock and the T-Birds lost 54-20. Skyline will play Pretty Prairie at 3:30 p.m. today. This will be the third time that they have played each other this season.